Just choose your favorite and you’re set. The dresses are beautiful for girls and women and the Beast costumes are very impressive, whether you want to dress a man or a toddler. ⇒ Here’s a selection of some of the best Beauty and the Beast Costumes available online now. Click here. The tale of the Beauty and the Beast goes back a long way – all the way back to 19th century France. The version almost everyone is more familiar with is the Disney animated film from 1991, which was a bit more child friendly and was very well received by all audiences. However, in the summer of 2017, Disney released a new take on the same story, this time in live action. It featured Emma Watson as Belle and Dan Stevens as the Beast. With these new designs, people were excited to see new versions of characters that they had seen for years, so they made for some great Halloween costumes, like the one on the right. What are the differences between the two Beast costumes? Click the image to see sizes and price. If you’re looking for a high quality Beast costume, they are available. 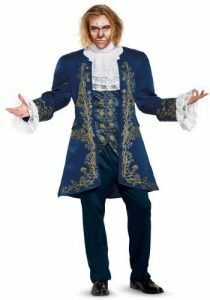 The Beast costume shown above is made from quality fabric. It comes in lots of different men’s sizes but or a few dollars more you can get it custom made. This is a very impressive costume. At the time of writing this costume had an average of 5.0 out of 5 star reviews. Click the image to see the short and long hair versions of this Beast mask and see the price. The mask above is a premium Beast mask that can be used with any of the Beast costumes. It’s very high quality but still affordable. There is a long hair version too. The long and short hair version look very similar at the front but the extra length can be seen quite clearly at the back of the mask. Click the image above to see more detail on both the short (shown) and long hair masks. Are there any changes in Belle’s costume in the new version? Click the photo for the price. Belle’s outfit has gone through almost no change between the 1991 version and the 2017 version. Disney recreated her animated outfit in real life to a tee. The first one you see in the movies is her everyday outfit, which consists of a blue dress, white shirt, and white apron. She also keeps her hair back in a ponytail in this outfit. Her other outfit is a grandiose, yellow dress with no straps. She also has long, yellow gloves coming up to her elbow. Obviously, this outfit would go really well in a couple costume with the Beast costume. If you include the objects that come to life, this makes an amazing family costume theme. And the kids will love their adorable costumes as a tea pot, cup, clock or candlestick. You can even get these items in adult sized costumes which makes a great group costume theme for friends. Most people really only think of Belle and the Beast when they first consider costumes from Beauty and the Beast. But really there are so many more choices. 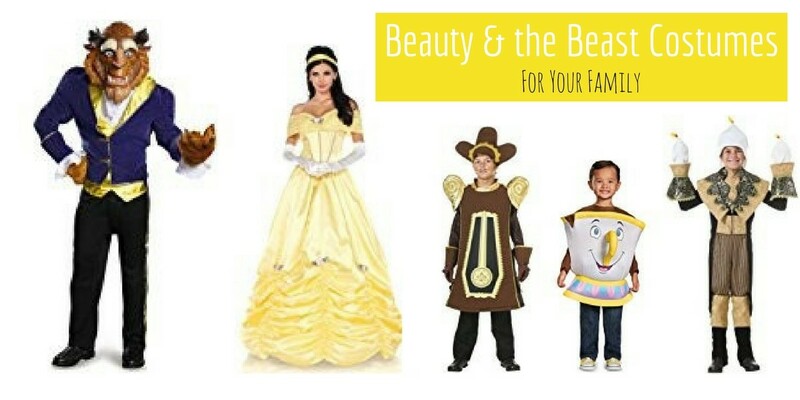 If you need more than two characters for Halloween, consider the Beauty and the Beast costumes. ☑ Looking for Super Hero costumes? Here are Justice League costumes for everyone.